Jonathan Cartwright, one of only three five-diamond chefs in Maine, was clearly on the away team at an "Iron Chef"-like competition Friday at the Sea Road School. Is there anything more intimidating to a chef than having a bunch of food critics watch his every move in the kitchen before they pass judgment on his dish? Yes, there is. It’s called a room full of fourth-graders. Master chef Jonathan Cartwright, who usually cooks in the high-end, tricked-out kitchen at the White Barn Inn, one of only three five-diamond restaurants in New England, found himself in that situation Friday when he squared off against Ellen Demmons, the food services director for Regional School Unit 21, in an “Iron Chef”-style competition. It was star chef versus the lunch lady, and judging by the way they wielded their knives, neither one was taking any prisoners. The competition, held in the cafeteria at the Sea Road School, included the unveiling of a secret ingredient — sweet potatoes — and a bunch of 9- and 10-year-old judges with picky palates. 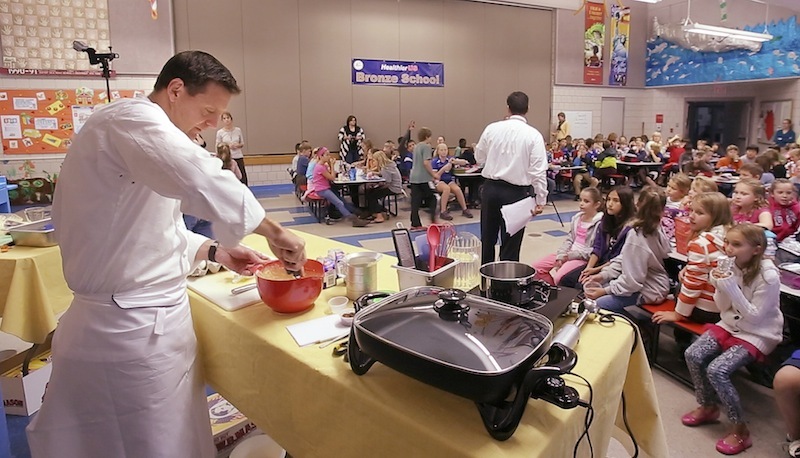 “Master chef Cartwright has traveled the world, has prepared food for royalty, and has really led a life that’s quite remarkable,” Principal Steve Marquis, who acted as host, told the students as the competition began. One of Cartwright’s daughters, Hanna, attends the school and watched the show from her seat in the back of the cafeteria. 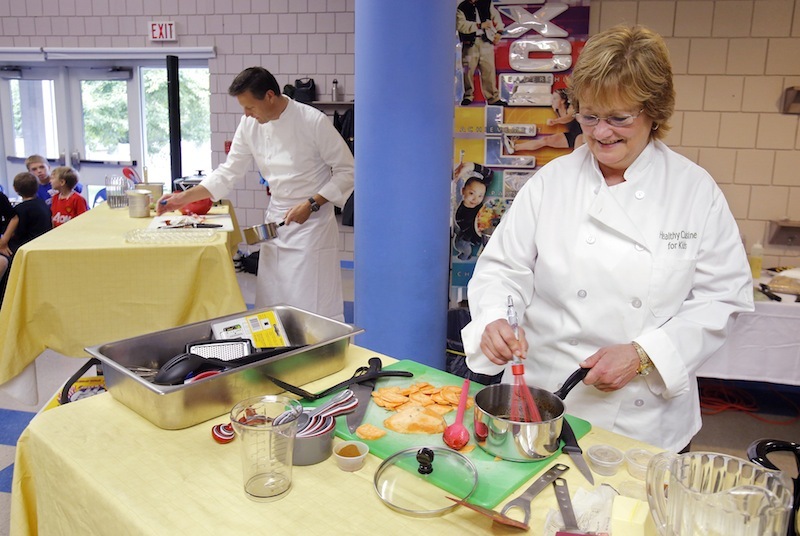 Demmons is president of the Maine School Nutrition Association, one of the sponsors of the cook-off and of Maine Harvest Lunch, which the school has been celebrating all week. She has worked in the food service industry for 30 years, but her only formal culinary training was a week-long “Healthy Cuisine for Kids” workshop at the Culinary Institute of America. 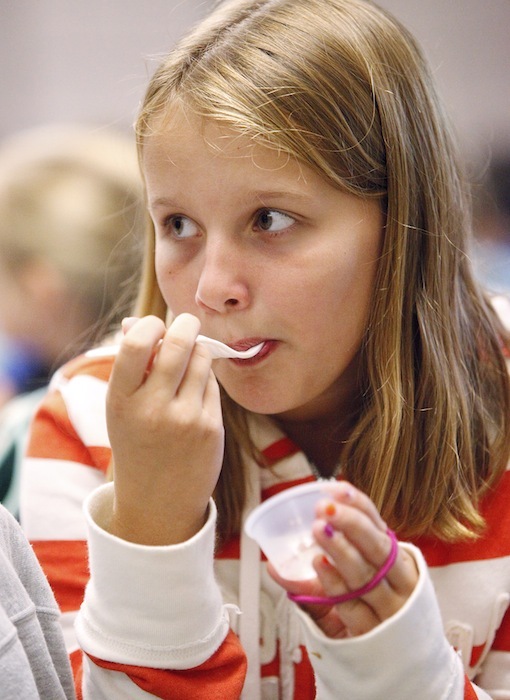 The yearly Maine Harvest Lunch program is designed to teach students about good nutrition and locally grown foods. On Monday, the kids ate chop suey with Archer Angus beef, a tossed green salad made with fresh Maine vegetables, and apples from Giles Farms. Other lunch menus during the week included Spear’s Farm butternut squash, corn on the cob from Harris Farm, and roast pork from Tibbett’s Farm. Friday’s competition was the grand finale. “In the elementary school, they have a garden and they plant it and they harvest it, but they didn’t really have that connection about seeing the vegetables prepared,” said Mary Gaucher, a member of the Kennebunk Elementary PTA Nutrition Committee, which co-sponsored the competition. Under the rules, each chef had to prepare a dish in 45 minutes, using only the secret ingredient and any food already in the school’s kitchen. For equipment, they had only what could be found on a cooking cart used by teachers in the classroom. If they brought anything else, they had to be willing to share it. When Marquis revealed that the secret ingredient was sweet potatoes, there were a few disappointed “awwws” and little applause. “I said, sweet potatoes!” the principal repeated, prompting the students to cheer a little louder. 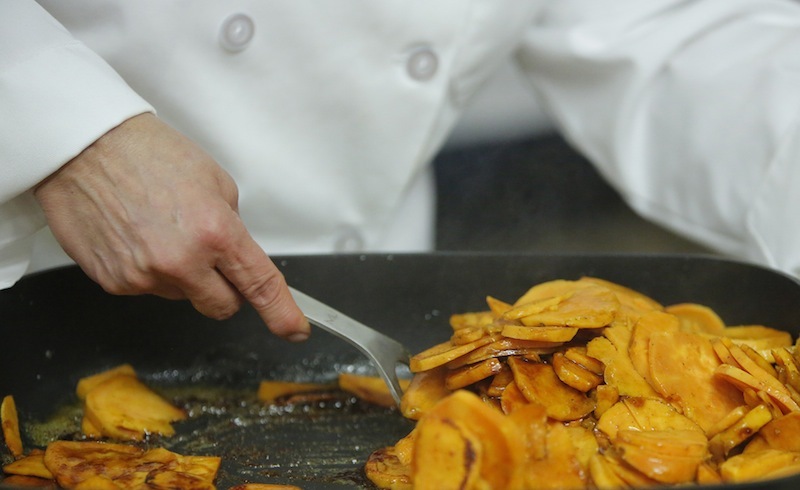 Cartwright immediately began peeling sweet potatoes while his pastry chef, Gabrielle Cote, prepared a small electric skillet and occasionally fetched seasonings and other items for her boss. Demmons peeled and sliced her sweet potatoes thin, and sauteed them in margarine. Her sous chefs were Michelle Fortier-Oosterman, aka “Mrs. O,” who works at the school, and teacher Mike McDonald. Cartwright worked intensely, never looking up and breaking into a smile only when the principal made a little fun of his English accent with a “you say tom-ah-toe, I say to-may-toe” joke. Cartwright started cracking eggs, and it became apparent that he was going for sweet potato pancakes. The sweet potatoes, seasoned with ginger, cinnamon, nutmeg, salt and pepper, roasted in the little skillet as he whisked low-fat milk into the eggs. Next, he grated Cortland apples, skins on, to make an apple compote and add some color and flavor to the pancakes. With seven minutes left, he started loading sauteed sweet potatoes for 120 students into a tiny food processor. Throughout the competition, Marquis peppered the students with trivia about fruits and vegetables (“Did you know that, technically, green peppers, zucchini, cucumbers and tomatoes are all fruit? … Did you know that Wilton, Maine, has a cannery — a place where you can items — that imports and cans dandelions?”) and at one point asked kids to come up to the microphone and share their knowledge. “There’s a museum of strawberries in Belgium,” offered a little red-haired girl, who said she saw it on a Snapple cap. With four minutes to go, Cartwright began making large pancakes that he would later cut into small pieces and serve atop a dollop of the apple compote. It was, he said, similar to a sweet potato pancake made at the White Barn Inn that is served under beef in place of mashed potatoes. Demmons served her dish first, a slice or two of sweet potato in each small plastic cup, and the reviews were good. “It was amazing. I liked the cinnamon,” said Nathan Payeur. “It tasted like a cookie, and it was kind of chewy,” chimed in Chase Harakles. Then came Cartwright’s sweet potato pancake. “This is sooo good!” said Donavyn Corcoran, holding up the pancake with his fork, eyes a little wide. He said he liked the sweetness of the apple on the bottom. Time to vote. Cartwright was up first. He encouraged the kids to “save your energy for dodge ball, all right?” when it came time to vote for his competitor. Next up was “our very own Mrs. Demmons. Let’s hear it for her,” Marquis said. Home girl had it in the bag. Take that, master chef. He said his dish was a little too ambitious for the equipment he had, and joked that he’d like to arrange a rematch at the White Barn Inn.